Today on our weekly Working Women Wednesdays feature on #ThatBusinessShow, we focused on branding and marketing and also discussed a resource for Women owned businesses to get “free money” so to speak through the use of Government grants. 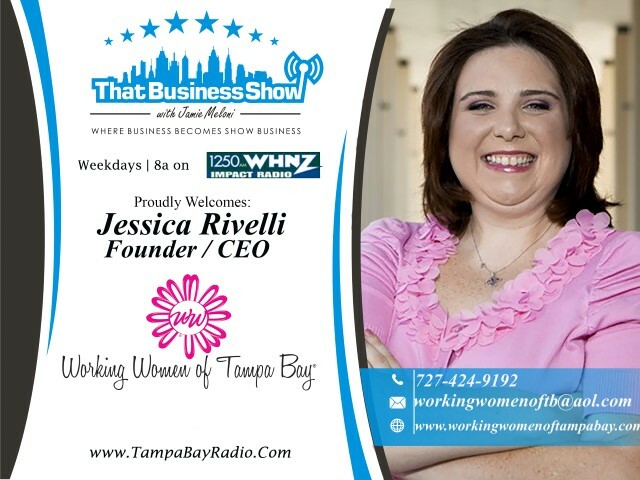 CEO and Founder of the Working Women of Tampa Bay Networking group, Jessica Rivelli, checked in at the top of the hour discussing a recent article in the Entrepreneur magazine of which is located here – http://www.entrepreneur.com/article/247215 The article is well written and talks about a number of specific programs and gives guidance on their application process inside the article. In addition, with the increasing regulatory environment, more pressure has been put on the importance of women owned and minority owned companies, especially in the government contracting space and by obtaining one of these designations, companies can give themselves an advantage over their competition. More to follow on obtaining these designations on a future show and be sure to check out http://www.workingwomenoftampabay.com for events and resources to help grow and support your business! 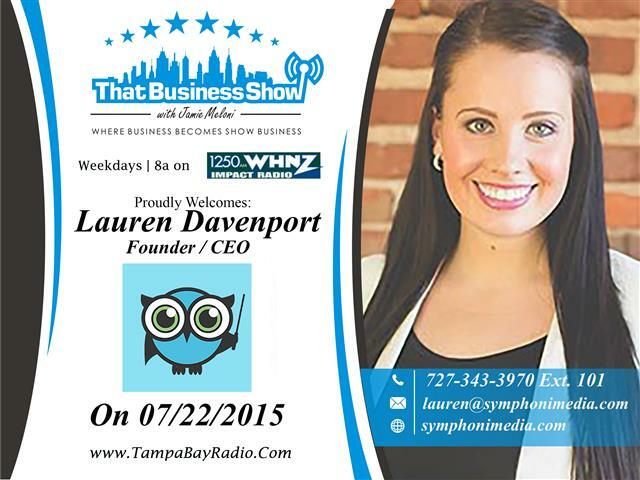 My 2nd guest on the show was Lauren Davenport, CEO and Founder of Symphoni Media. Lauren is a young entrepreneur that overcame objections and negativity to grow her company into a leading area online marketing service assisting both local and publically traded companies stand out in the online environment as well as with social media. Lauren shares her story of business development, and many great tips on social media use on this segment and gives out a resource of which I was not even familiar with located at http://www.canva.com which is a simple design program for online marketing, website development and social media. Lauren frequently speaks on the topic of online marketing and social media and has a staff of professionals that can assist you with an entry level project to a large scale undertaking. Current clients include USF, Marriott Hotels and ASI and 95% of her clients come from referrals. Contact Lauren today to help bring out your online presence at 727-343-3970 X 101 or email at lauren@symphonimedia.com and learn more at http://www.symphonimedia.com! 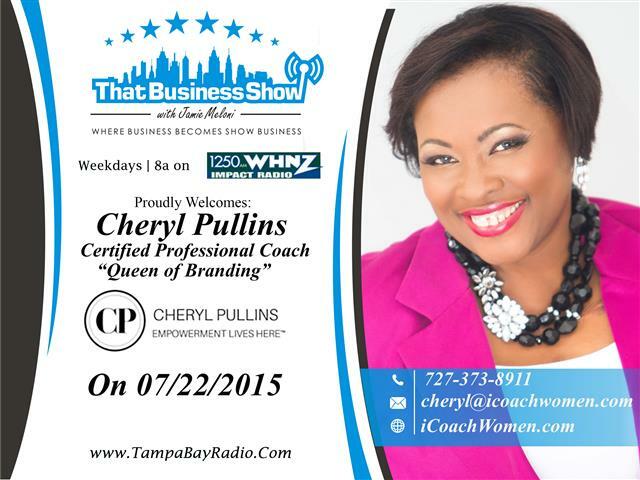 On the 2nd half of the show, I welcomed Cheryl Pullins, the Queen of Branding, to the show. Cheryl has coached hundreds of women on how to create a brand that is recognized, respected and remembered. Cheryl has leveraged more than twenty years of Corporate Human Resources experience to coach and mentor multi-passionate women by helping them blend their passions, master their brands and make more bank. Through her brand, “BRANDfluent, Cheryl takes professionals through a 90 day program that focuses on clarity of purpose in your business, how to build a profitable business model, establishing credibility and how to develop a system for consistent performance and results. Cheryl is a frequent speaker on the topic of branding but also speaks on a number of other levels and she shares a great story of her speech in front of a women’s correctional facility through a TEDx event. Cheryl also mentioned her upcoming event being held November 13-13, The Iconic Woman Luxe Work and Play Weekend and you can keep up to date on this event and many more at http://www.icoachwomen.com. Cheryl is also speaking at The Working Women of Tampa Bay Power Lunch on August 21st and being held at Brix 33, 8351 State Road 54, New Port Richey, more information can be found here http://www.workingwomenoftampabay.com/event-1994793 Reach out to Cheryl for your next speaking engagement or for a personal or group coaching sessions – she can be reached at 727-373-8911 or email at Cheryl@icoachwomen.com! This entry was posted in Entrepreneurship and Business and tagged branding, business, entrepreneur, online marketing, real estate, working women of tampa bay. Bookmark the permalink. ← Show Recap – Life of a Salesman with Coldwell Banker President Clark Toole!